We love to “go it alone.” But, as Dr. Phil often has said, “How’s that workin’ for ya?” As I age, and discover that I can’t go as fast as I used to go, I can’t accomplish as much as I used to, my recall isn’t as sharp as it used to be, etc., it is reminding me that one day I may need more and more help, to even accomplish things in life that I now consider mundane. But it is also a reminder to me of just how limited I am, and where my real sense of purpose and strength is found – in Christ. The things that I can accomplish purely out of the flesh, are really “nothing” at all. Rather, now, I am striving more and more each day to accomplish things that are works that the Lord desires – for His Kingdom and for His glory. 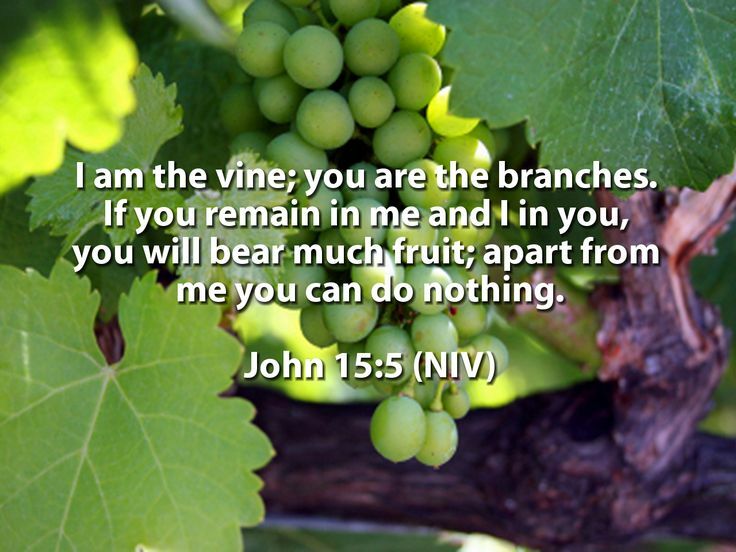 But I am also striving to accomplish things that can only be done by His power at work in me – through that “connection.” So that it is evident to me that it is not I who accomplish it, but Christ working in me. Therefore, I am actually setting my sights higher – on bolder things – God sized dreams! Finally, this verse reminds me of how important it is to remain connected to Christ through the Sacrament of Communion. Jesus also says, earlier in John’s Gospel, “Whoever feeds on my flesh and drinks my blood abides in me, and I in him.” (John 6:56). You wonder whether you need to go to church or not? This is one great reason to … to fulfill Christ’s call to ABIDE in Him. He tells us that this happens when we gather around the table to share the meal of Communion that Christ instituted for His Bride, the Church. Life is full of questions, isn’t it? I always thought the big questions were pretty well set … “where did people come from?” … “what’s the meaning of life?” … “what happens when I die?” But it turns out that people have a LOT more questions than that! Google, the world’s most popular internet search engine, has an “auto-predictive” feature that begins to guess what you might be asking based on what other people are asking. So if you begin to type in “why can’t” … it currently is suggesting the rest of your question might be, “why can’t I sleep?” This feature can be helpful and annoying at the same time. But a simple analysis will show that there are thousands upon thousands of questions that people come up with every day. Some more meaningful than others. I’d like to propose to you that there is only one question that really matters. Pastor Rick Warren says in his book, Purpose Driven Life, that it will be the first question that God asks when you get to heaven: “What have you done with my Son Jesus Christ?” … In other words, have you received Him, or have you rejected Him? All of life’s meaning and effect, as well as all of eternity hangs on this question. So, to get after it, we will be turning in The Story* (our 31 week message series at Redeemer) from the Old Testament to the New Testament, and asking the question: Who is Jesus Christ? But there are those who are asking, and who have answered, along with Peter, that Jesus is the Christ; the Messiah. He is God in the flesh. He is the fulfillment of Old Testament prophecies. He is the answer to God’s promises. He is the King. He is the Savior. Your answer to that question will be the greatest one you will ever give. We are setting out to answer that question over the next weeks at Redeemer, as we continue The Story. Join us! * If you have not gotten The Story, books are still available. Pick up your copy today!